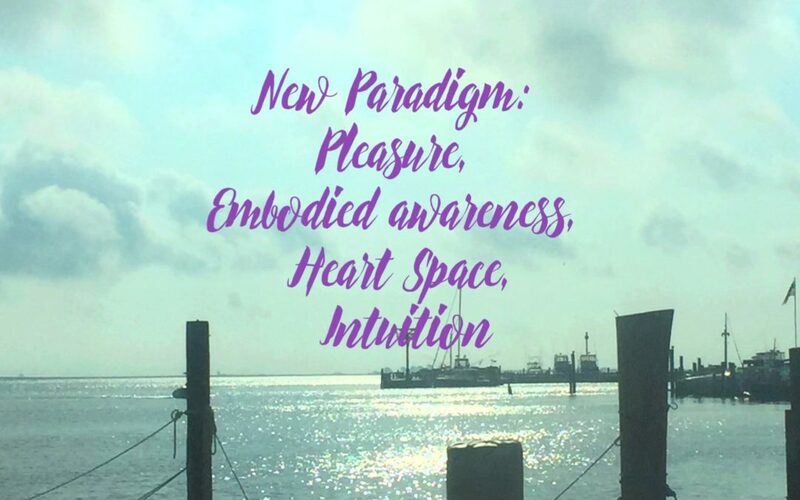 The new paradigm is presence, pleasure, moment to moment embodied awareness, living more deeply from the heart and less from the mind, and living from your own intuition. Never has there been a time when there has been a sense of such a divide from the fear-based mind and the heart. Are you feeling this? Do you have days where your thoughts of worry or gripping just take over? Do you have days where you more easily sinking into your body and heart and feel clear? These strong polarities are happening in many of us. This is the transition into a new way of being. A time where rushing, pushing forward, hustling and jamming things into your schedule just to get things done is no longer really working. Yeah, you can exist like that but it won’t sustain nearly as much as it used to. Does your being crave space? Do you tolerate very little when it comes to burnout? Do you feel like the hustle life isn’t serving you anymore? The new paradigm is where flow allows for exponential results. Where space allows for massive ideas and paradigm shifts. When doing less actually allows you to embody more and create more. If you feel like you are trying to paddle upstream and it is just not working I totally understand. If you feel like the way you used to do things no longer works I understand. Here is the thing, embracing this new reality goes against all that you have relied on in the past. Yeah, the concept of flow, law of attraction and surrender have been around for a long time. But now more than ever, we are being called to choose. To embody a new reality, a new way of being. A way that is delicious but can really be intense getting there. I support my fellow lightworkers and empaths on this transition. It is ultimately choosing yourself over and over. Choosing your hearts calling, your embodied awareness. Choosing to go with your desires and let the fear take the back seat. One way I can support you is by being able to see and know so clearly where you are at vibrationally. I can hone in on what is holding you back, what belief/paradigm you are inhabiting that is keeping you stuck in your life and direct you to know it for yourself so then what? So then you can release it and choose a new way. Awareness is always the first step. Then all the rest follows. Connect with me and we can talk about how you can work with me and I can assist you in your life as you transition to embody YOU even more. What might be on the other side of your next transformation?